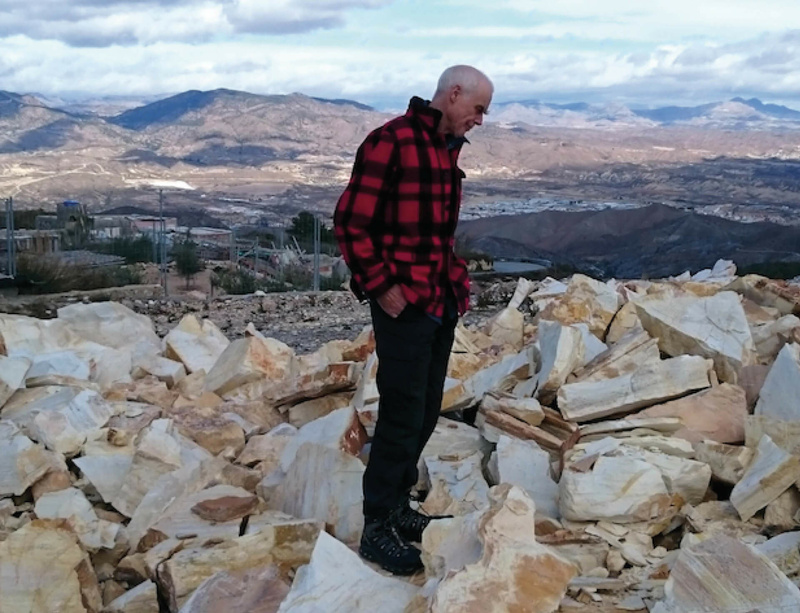 From 13 May until 21 August 2016, Centro de Arte Contemporáneo de Málaga, Spain presents COLD STONES, a new exhibition by British artist conceptual artist Richard Long. The exhibition brings together a selection of sculptures, driftwood drawings, photographs and text works dating from 1967 to the present day. It also includes new works created specifically for the exhibition: a sculpture made of granite stones and marble from the Macael quarries and a large wall work made by applying mud to the wall with the artist's hands. Through these pieces, Long recreates the experience of a particular landscape within an indoor context and asserts an abiding relationship to the land. Richard Long has been in the vanguard of conceptual and land art in Britain since he created A Line Made by Walking in 1967 while still a student. This photograph of the path left by his feet in the grass, a fixed line of movement, established a precedent that art could be a journey. Long walks alone in nature for days or weeks on end, covering great distances in locations round the world: mountains, scree fields, beaches, deserts, rivers and snowbound landscapes. In the course of these walks he interacts with the landscape, leaving his footsteps and the sculptures he fashions out of materials found in situ behind as evidence on site. The artist documents these walks and ephemeral interventions in the landscape, which attempt to deny man's dominion over nature – doomed as they are to disappear due to the effects of erosion – in the manner best suited to each idea, with photographs, maps and text works in which the measurements of time and distance and the place names are infused with poetry. The pieces on display for COLD STONES record the experience of these landscapes and stimulate the spectator's imagination, allowing visitors to accompany Long on his various passages. Watch a time-lapse of Richard Long's installation of his new mural, Muddy Water Wall (2016), here.